Hilton LAX is a five-star hotel located minutes from LAX airport which caters to business travelers and offers a range of premium amenities and services. With its luxurious, lavish styling and extensive business event hosting facilities, this hotel offers its guests a sophisticated, indulgent experience, while providing ample opportunities to sit down, shake hands, and make connections. As soon as you walk into the hotel, you’re struck by its refined and classic styling, evident in the luxurious materials and interior design. A grand staircase leads away from the concierge and lounge, and into the suite of accommodations and conference facilities. A complimentary 24-hour shuttle service to LAX makes sure you get in and out of the hotel exactly when you need to. 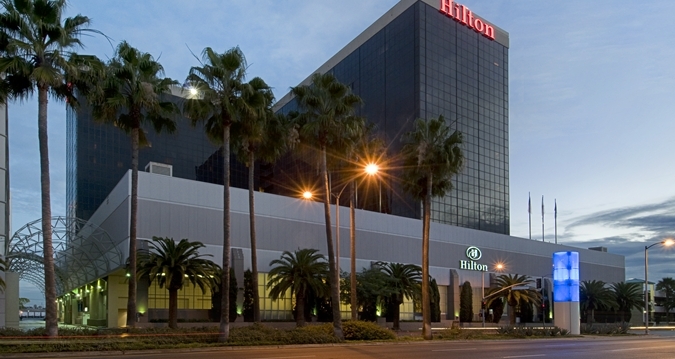 The Hilton LAX features 1,234 rooms, all designed with comfort and style in mind. Whether you’re a business traveler or a family looking for a quiet and classy vacation, there are accommodations here to suit your needs. The hotel’s Guest Rooms provide the ideal retreat from the lively metropolis that is LA. Available with one king-sized bed or two double-sized beds, and featuring a 42″ flatscreen TV and large workstation, the Guest Rooms let you unwind after a busy day or eagerly prepare for a new one. Accessible Guest Rooms are also available. Suites are located on the highly coveted Executive floors, and feature two options: a one-room option with King-sized bed, and a two-room setup which includes a spacious bedroom and living room for entertaining guests or clients. Both come with complimentary breakfast. Executive Rooms are palatial suites that are available with one king-sized bed, or two double-sized beds. Guests on the Executive floor gain exclusive access to the Concierge Service Floor and Towers Lounge, offering private check-in and a host of premium services. Complimentary breakfast is offered to Executive floor guests, and a unique, personalized dining experience is available in the evenings, complete with bartender service. All room options come with large, flat-screen lcd tvs with premium channel options, and wifi is available for a nominal fee. Stunning bathroom amenities are finished in marble and feature plush, premium towels and toiletries. A large outdoor heated pool and hot tubs, as well as a complimentary fitness room, are perfect for slowing down your day and taking a load off. Sight-seeing tours, valet service, and a gift shop are all available from the friendly staff at the concierge desk. Business travelers benefit from one of the most expansive set of facilities in the city. Over 55,000 square feet of event space includes the 13,000 sq. ft. Plaza Ballroom, and 32 breakout rooms for more a more intimate rendezvous. Hotel staff are always on standby for business guests to accommodate your every need, and onsite dining services provide catering for every taste. With its unique and celebrated dining options, you’ll never need to leave the hotel. Partake in a classic Chinese breakfast at The Café, or relish in northern Italian cuisine at Andiamo, all while taking in the beautiful scenery of the hotel’s four outdoor gardens. Situated by the sprawling LAX airport for easy access to all of LA’s wonderful attractions and business destinations, the Hilton LAX is your go-to solution for a business trip or vacation in this world-class city. Hilton LAX is a five-star hotel located minutes from LAX airport which caters to business travelers and offers a range of premium amenities and services.